In November 2013, I spoke to Amina Ali Cymbala, whose father Mohamed Ali, was one of a group of Bengali ex-seamen who settled on the Lower East Side of Manhattan, and married within the Puerto Rican community there. Part of our conversation follows below. 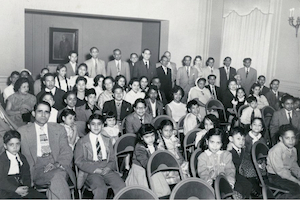 She also shared the photo here to the left, which shows a number of the children of the Pakistan League of America at a league event in the late 1950s. If you recognize anyone in the photo, please comment at the bottom of this page. Vivek Bald: In my research, there were a lot of arrows pointing to the Lower East Side, and a cluster of South Asian ex-seamen who had settled there, going back to the 1920s. So I’m curious to hear from you about your father’s and mother’s stories – and their respective families’ stories – and also just hear your memories of who all was on the lower east side and where they were – your memories of those families. Amina Ali Cymbala: My father was a chef at Hotel Pierre years ago. This was back in the ‘60s. There was a special restaurant in the Hotel Pierre in Manhattan that was just Indian food and all the waiters and chefs, everybody would dress up in the Indian clothing and all the celebrities would go there because the Hotel Pierre was like the number one hotel that time in the city. I remember, for a magazine, my father was there, you’re too young to remember but there was a gentleman on T.V., on a game show, Password, his name was Bill Cullen, and in the magazine article they use Bill Cullen because he loved eating Indian curry and there was another gentleman in the picture, there was my father, next to Bill Cullen. And [my father and his friends] would have the best meats and all, on weekends, like you said in your book. On Sundays my father would be cooking even though my mother learned how to make curry, my father on Sundays – because he brought home some of the meat they didn’t use at the hotel. He would bring home the best beef, the best chicken and we would have the curry that he cooked and it was a big thrill because this is the big chef from the Hotel Pierre cooking. And he was part of that union. When he retired, he was part of that union. Whatever the local is for the hotel workers union. I remember when we were little – like now my nieces and nephews call me Aunt Amina. In those days you never used the name. You would just say Chacha [for all your father’s friends] – my Chacha, my Chacha. So I really don’t remember many of the names. But I can email you all the names and the wives and the children [that I grew up with], because I grew up with all the children where the wives were Puerto Rican and the husbands were from [East] Pakistan and they had children. I grew up with girls named Ayuba and Fatima and Seena and Evelyn and who else did I grow up with… I can’t remember but the father was Abdul Aziz, I remember Mauklis Miah, Riaj Miah – there are so many names in my album that my mother saved – I have pictures and it’s just so great. A lot of them when I grew up, they were all living on the Lower East Side, these were the kids I grew up with and we were within walking distance of the Pakistan League of America. And those card games … it’s so funny because my father, I mean they’re supposed to be religious, right, but they would play card games. He would go there Saturday and that’s where my father would drink. He wouldn’t drink in the house. They’d bring those card games over there Saturday night, my mother knew, they would get together and whatever they played, poker or whatever they played. But that was at the League. Just like Knights of Columbus. It was the same type of thing, their little social club. And the New Year’s Eve I remember, oh was so much fun and the parties there, I mean it was a big deal, there were like hundreds of people. It was very big, this Pakistan League of America. I remember there was a top floor and down, the first floor, there was a big kitchen. I still … I can see it now. How I found you is that I was trying to research myself. Because my kids – I’m a good Latin dancer and my kids only think I can do Salsa and I said you don’t understand, when I was little, I used to dance Bengali dances. They said no and this is why I went on the Internet [to search for proof]. Because, as a child, there was a dance instructor [in New York] – Siraj Choudhary. I’m not sure of the spelling of his name but he was my dance teacher. He was not married, he did not have any children, and my father, every Sunday – I didn’t want to do these dances but you know when you’re eight and nine years old, you do what you’re told. And since my father wanted me to represent the Pakistan League of America, I used to go to Siraj Choudhary’s house with these other children. He used to teach us these dances and I performed with other children in Washington D.C. and Philadelphia. And there are films in the archives somewhere. So these dances were filmed and when they would have their monthly meetings at the Pakistan League of America, they would show the films and I was 8-9 years old and the screener would say, “Presenting Amina Ali” and I got so excited because I was in a movie. And this is what I’m trying to locate – these films must be somewhere. When the Pakistan League of America disbanded, somebody must have these films and that’s all I remember. I remember going to Washington D.C. to this big auditorium and the same thing in Philadelphia, representing the Pakistan League of America along with other kids. That’s why I was searching on the Internet, and there I go, and there I see Pakistan League of America, I see my father’s picture. I said, “What is this!” And then I found out about your book. Vivek Bald – What year would that have been, when you were 8 or 9? Amina Ali Cymbala – Let’s see, I was 8 or 9, I was born in 1949, so I’m thinking 1957, 1958. Once I hit 10, I don’t think I did it anymore. It disbanded. Those two performances I remember. We went for the weekend. We went on a Friday and Saturday we finished rehearsing and the performances were on a Saturday. Then we came home on Sunday. Very exciting but I didn’t pay attention because this was something my father wanted me to do. I really didn’t want to do it but I did it. This was part of the heritage: we had to do the dances. My name is Razia Choudhury my uncle is Siraj Choudhury all my summers were spent in Manhattan on the lower east side at his apartment on Eldridge street. He also owned the Koi Noor . Every Friday after the restaurant was closed we would watch the Indian movies at the restaurant. Looking at the front cover of the book Bengali Harlem, the gentlemen kneeling down looks like my uncle.